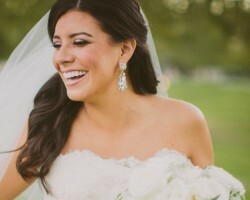 Kiss and Makeup offers wedding hair and makeup in one place. Brides can discuss the look they are going for with the experts at this store and they will work to achieve this perfect look on your wedding day. This company has been rated as one of the best by top wedding publications and companies including Wedding Wire and The Knot. You can rest assured that when you hire this Texas makeup company, you will never be disappointed with the results. On your wedding day you will be the focus of everyone’s attention and have the most pictures taken of you at this one event than any other in your entire life. This is why so many women choose to work with Lashes & Lace to have their bridal makeup done professionally. Not only does this mean having a flawless look, but it also means having your best features accentuated by the experts. This is something reviews of this company always rave about. Elan Makeup Studio has been offering wedding makeovers for many years. They have developed various packages to make sure that they are serving their clients in the best ways possible. Their packages include various trial runs and bridal portraits but the most important part of any package is the actual wedding day makeup. This team will be there for 3 hours at your chosen location to provide professional airbrush makeup and hair too. This look will be decided upon with expert advice before the actual wedding day arrives. Eudocia “Honey” Wilson is one of the Arlington makeup artists that is very well known on the wedding scene because she is so accommodating. This artist is always able to work with brides to achieve the look they want with her expert guidance. This means that whether you would like natural and understated makeup or have certain features more accentuated, this professional can make it happen. When you work with this expert, the prices are based on an hourly rate and therefore can be as affordable or as expensive as you would like. Looking beautiful and fresh on your wedding day starts with hiring a professional makeup artist in Arlington, TX to help you achieve your desired look. When you hire Heavenly Faces, you will work with an expert team that can use traditional makeup on the big day or apply permanent makeup with a touch up on the wedding day. You can work with the artist to come up with a look that you love and even book a trial run to make sure the look is really what you want.